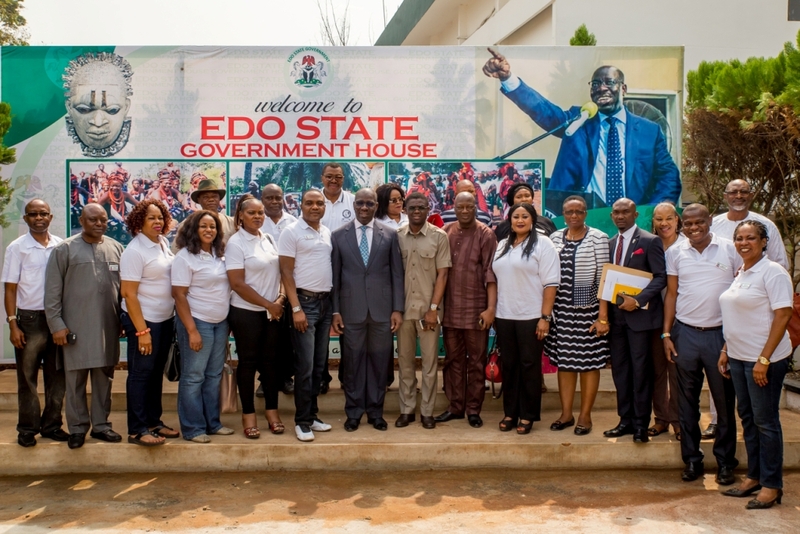 Edo State Governor Mr. Godwin Obaseki has called on Edo National Association Worldwide (ENAW) who are on a seven day medical mission in the state to join hands with his administration for improved and better health care for the people of the state. He made the call while receiving members of the group who are on a courtesy visit and medical mission to the state at government house on Monday in Benin City. Obaseki said the group who are medical practitioners in the Diaspora should join hands with his administration to improve on the health care system adding that his administration will fix the naughty issues challenging the sector. He said one area he wants the group to assist his government is in the area of nursing care. “We don’t have nursing school any more, our concern is how to get our people back home to come train us here on how to get the best nursing care like it is obtainable oversea. I don’t believe that the doctors over there are better than the ones we train here”. “Most of us are lucky to have gone through a decent primary, secondary educational system and get the best health care that worked that is why we are who we are today. For me, I believe God did it for a purpose and the only way to thank him is to turn around and make sure those coming behind gets a better access than we got”. Obaseki said the essence of coming to government is not to make money but to serve the people as the purpose of politics and governance is to give back to the people. He said he understands the frustration and anxiety they face when they look at the disparity between the health care system oversee and the one obtainable here in the country but encourage them that the disparity can be bridged faster than most people can imagine. He said his administration will focus on health infrastructure as good hospital building does not translate to good medical care. Earlier, the leader of the delegation Edison Osifo congratulated the governor for his victory and subsequent swearing-in as the Governor of Edo State assuring the administration of their support. He said the group are in government house to inform the governor of their presence in the state on a seven day medical mission which the group have done for over four years now. He said the medical mission will cover the three Senatorial District in the state. “We are here to diagnose, monitor and also make sure that we advise and plea with our host the local doctors to help us follow up whenever we leave. We have embarked on a journey of donating four (4) incubators to the hospital in the three (3) senatorial District in the Edo state”. Osifo said the group would embark on health promotion, disease prevention and also help to create awareness of disease that can be cured with just exercise and with the right diet.